This article will aid you to remove .nosafe Scarab Ransomware. Follow the ransomware removal instructions provided at the end of the article. .nosafe Scarab Ransomware is one that encrypts your data and demands money as a ransom to get it restored. Files will receive the .nosafe extension. The .nosafe Scarab Ransomware will leave ransomware instructions as a desktop wallpaper image. Keep on reading the article and see how you could try to potentially recover some of your locked files and data. Short Description The Scarab ransomware encrypts files by placing the .nosafe before the affected files on your computer system and demands a ransom to be paid to allegedly recover them. Symptoms The Scarab ransomware will encrypt your files and leave a ransom note with payment instructions. User Experience Join Our Forum to Discuss .nosafe Scarab Ransomware. The .nosafe Scarab ransomware samples can be spread using a variety of different ways. The scope and quantity of the released files will depend on the chosen targets. It is presumed that like previous Scarab ransomware the most popular tactics will be utilized. One of the main methods is to coordinate email phishing campaigns — in the body contents links can lead to the ransomware infections. An alternative approach is to directly embed the .nosafe Scarab files as attachments and explain in the messages that the recipients must open them. The criminals can construct malicious web sites that appear as being sent by a well-known company. Fake product landing pages and scam tactics can include a variety of typical cases: software updates, new application releases, beta test software and etc. Whatever the use case the virus files will be delivered. The hackers can additionally construct pages that mimic legitimate sites: search engines, download portals and etc. Infected Documents — The installation instructions can be made part of the macros that are part of common document types: presentations, spreadsheets, text files and databases. When accessed by the victim users they will spawn a prompt asking for the macros to be run. The quoted reason is to “correctly view the document”. This will lead to the virus installation. Application Installers — The criminals can create setup files of popular software with virus instructions built into their code. This is done by first downloading the legitimate files and modifying them accordingly. They are then released through the same mechanisms as the standalone virus files. The .nosafe Scarab ransomware files can additionally be spread via browser hijackers — they are malicious plugins which are made compatible with all of the popular web browsers. Many of them are uploaded to the relevant repositories with fake user reviews — the descriptions will promise great improvements to the software by adding in performance optimizations or new features. In reality the dangerous Scarab ransomware sample will be implanted. The .nosafe Scarab ransomware follows the typical approach of previous viruses of the same malware family. Usually a series of components will be launched one after the other as configured by the criminal collective. Such include information gathering which is used to extract sensitive content from the infected machines. This is done in order to generate an unique identification signature for each affected computer. Its input parameters are system configuration options, user settings and the list of hardware components. This same engine can also be configured to expose the identity of the victims by looking our for personal data: an user’s name, address, phone number, location and any stored account data. If configured so the virus engine can interact with the Windows Volume Manager which would allow the criminals to access available network shares and removable devices. The collected information can be used by another module called security bypass which scans for the presence of programs and services that can block the virus. They will be bypassed or entirely removed and typical cases will include the following: anti-virus products, firewalls, virtual machine hosts, sandbox environments and intrusion detection systems. At this point the virus will have the ability to access all of the system services and configuration files. This is particularly dangerous as Scarab ransomware threats are notable for setting themselves as persistent infections. This means that they will access and change boot options in order to start the engine automatically as soon as the computer is powered on. And since critical areas have been affected manual user removal guides may not work as access to the recovery menus and tools can be blocked. Viruses like the .nosafe Scarab ransomware cab also modify the Windows Registry — this is very dangerous as changes can be made to both the operating system related strings and third-party applications. As a result of this severe performance degradation can occur to the point of not being able to use the computer at all until the threat is completely removed. This can affect also services and programs — they can quit with unexpected errors. One of the most dangerous consequences of having this virus installed is when additional payloads are delivered. In particular Trojans are one of the most often carried threats. They will setup a connection with a hacker-controlled server and allow the criminals to take over the affected computers, steal files, spy on the victims and cause other malicious actions. Such threats can also delete sensitive data such as System Restore Points, Backups and archives. In these cases a data recovery solution must be used. The .nosafe extension will be applied to all processed files. 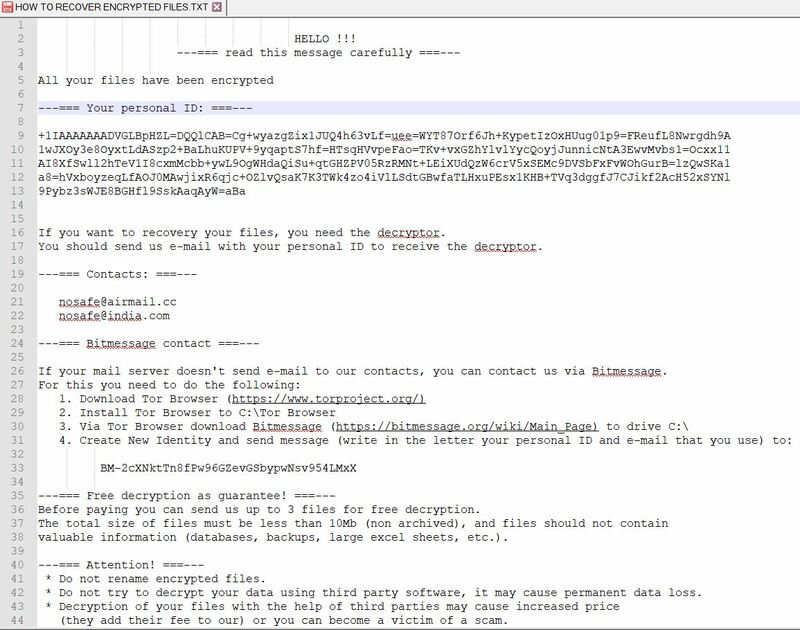 The crafted ransomware note will blackmail the victims to pay them a decryption fee. If your computer system got infected with the .nosafe Scarab ransomware virus, you should have a bit of experience in removing malware. You should get rid of this ransomware as quickly as possible before it can have the chance to spread further and infect other computers. You should remove the ransomware and follow the step-by-step instructions guide provided below. Threats such as .nosafe Scarab Ransomware may be persistent. They tend to re-appear if not fully deleted. A malware removal tool like Combo Cleaner will help you to remove malicious programs, saving you the time and the struggle of tracking down numerous malicious files. Threats such as .nosafe Scarab Ransomware may be persistent on your system. They tend to re-appear if not fully deleted. A malware removal tool like SpyHunter will help you to remove malicious programs, saving you the time and the struggle of tracking down numerous malicious files. Note! Your computer system may be affected by .nosafe Scarab Ransomware and other threats. SpyHunter is a powerful malware removal tool designed to help users with in-depth system security analysis, detection and removal of threats such as .nosafe Scarab Ransomware. 1. Install SpyHunter to scan for .nosafe Scarab Ransomware and remove them. 2. Scan with SpyHunter, Detect and Remove .nosafe Scarab Ransomware. Ransomware infections and .nosafe Scarab Ransomware aim to encrypt your files using an encryption algorithm which may be very difficult to decrypt. This is why we have suggested several alternative methods that may help you go around direct decryption and try to restore your files. Bear in mind that these methods may not be 100% effective but may also help you a little or a lot in different situations. Note! Your computer system may be affected by .nosafe Scarab Ransomware or other threats. Remove .nosafe Scarab Ransomware by cleaning your Browser and Registry. Fix registry entries created by .nosafe Scarab Ransomware on your PC. Combo Cleaner is a powerful malware removal tool designed to help users with in-depth system security analysis, detection and removal of threats such as .nosafe Scarab Ransomware. Step 5: In the Applications menu, look for any suspicious app or an app with a name, similar or identical to .nosafe Scarab Ransomware. If you find it, right-click on the app and select “Move to Trash”. Step 6: Select Accounts, after which click on the Login Items preference. Your Mac will then show you a list of items that start automatically when you log in. Look for any suspicious apps identical or similar to .nosafe Scarab Ransomware. Check the app you want to stop from running automatically and then select on the Minus (“–“) icon to hide it. Remove .nosafe Scarab Ransomware – related extensions from your Mac’s browsers. A pop-up window will appear asking for confirmation to uninstall the extension. Select ‘Uninstall’ again, and the .nosafe Scarab Ransomware will be removed. When you are facing problems on your Mac as a result of unwanted scripts and programs such as .nosafe Scarab Ransomware, the recommended way of eliminating the threat is by using an anti-malware program. Combo Cleaner offers advanced security features along with other modules that will improve your Mac’s security and protect it in the future. Hey !, I found this information for you: ".nosafe Scarab Ransomware — How to Remove It". Here is the website link: https://sensorstechforum.com/nosafe-scarab-ransomware-remove/. Thank you.